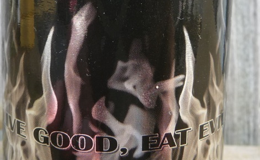 This black hot sauce comes in a 5 oz bottle, complete with an all black label with silver lettering and flames. You kind of know what you’re in for just looking at it. 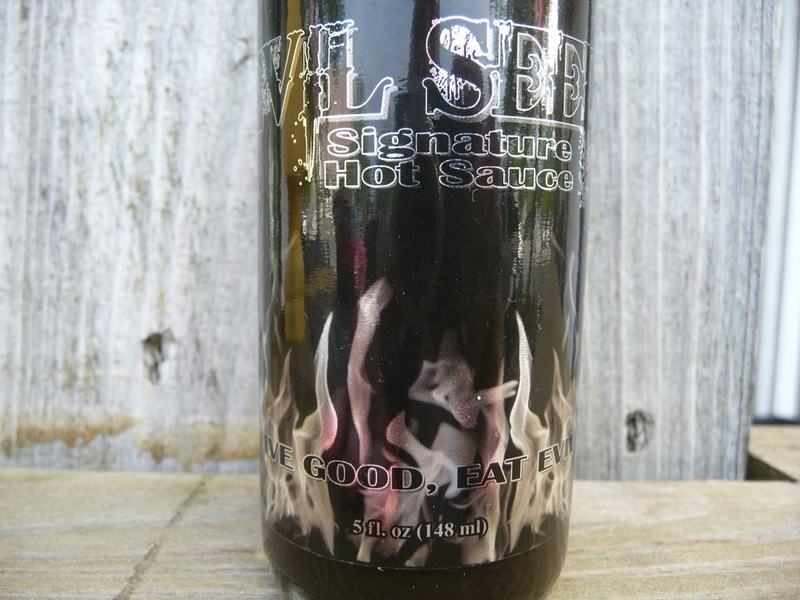 Emblazoned with their motto “Live good, eat evil“, this is a hot sauce from the dark side. It packs a punch folks. The lemon juice and vinegar bring a tart taste, followed by the red habaneros that bring on the heat. They are tempered by the milder jalapeños and sweet agave syrup. Flavor with heat, and lots of it, is the game here. 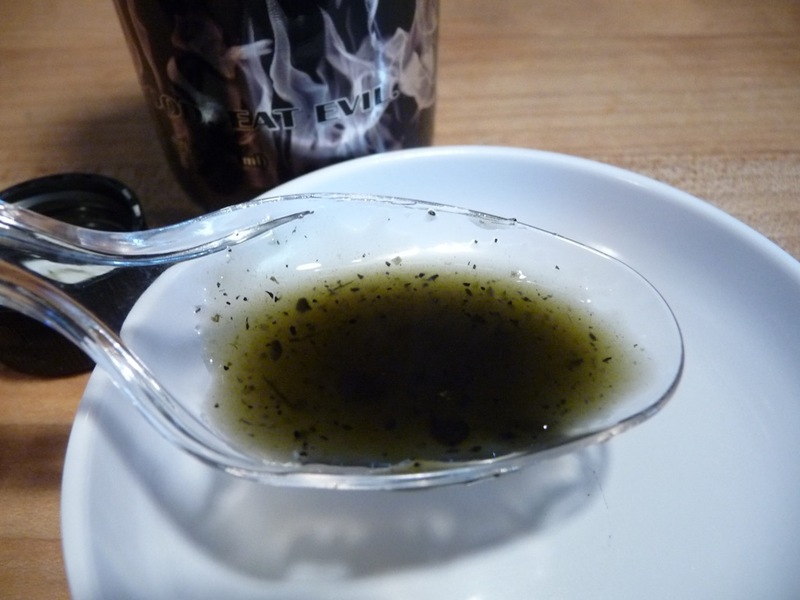 The texture is thin, dark (hey’s it’s black), but with lots of black pepper and flakes of garlic and onions and pepper pieces floating about. I can’t help but think this is THE PERFECT hot sauce to have on hand come next Halloween. Overall Heat 3.5: – Black and hot (insert coffee joke here), this is not a tame or mild sauce. Evil Seed brings on the EVIL! The cartoon graphics on the label are really kitschy – a woman screams “Live good” – an evil peach replies “Eat Evil”. The bright orange colored sauce sports a good amount of small bits of fruit and seeds. 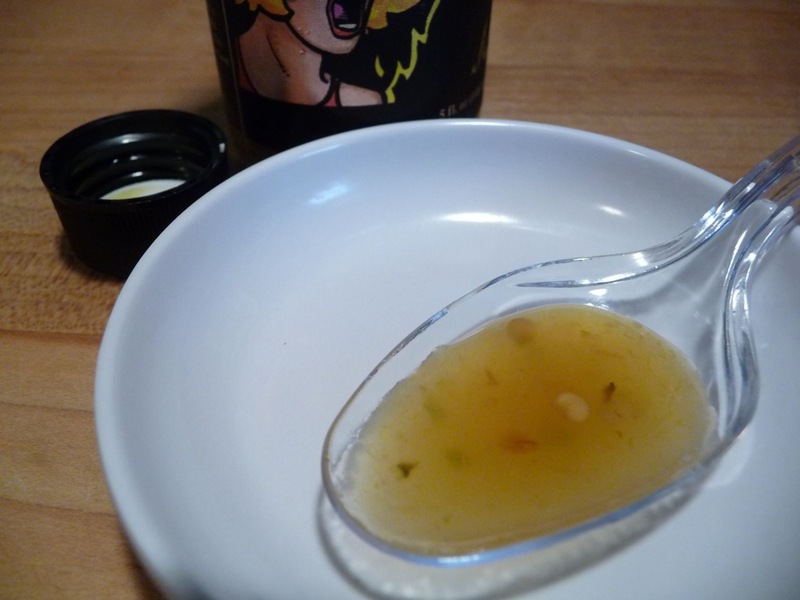 This is a slightly fruity hot sauce that is a bit tamer than Evil Seed’s Original. A bit more flavor too, in my opinion. A light fruitiness hits your tongue, followed by a heat that is sure to be Evil Seed’s signature heat profile – that being the habanero. Overall Heat 3.0: – The sting from the peppers is light – about a medium. Marilyn loved the peach flavor. Visit EvilSeedSauces.com for these sauces and their other offerings. And stay in touch with Evil Seed Sauce Company on Facebook. 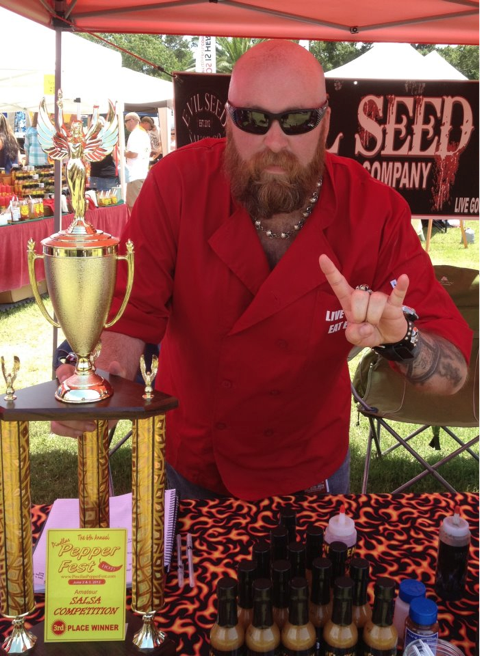 We also interviewed Evil Seed’s Patrick McGill on our podcast, HotSauceWeekly.com, at Peppers at the Beach 2012. I’m liking the Evil Seed, does that make me evil? The label is so cool but the lemony habanero kick is what calls me.